← Moving the Court of Law; Inviting ideas and opinions from the public ! Kind Attention, ESI Corporation Members! Please ask these questions on 07.04.2015! “By the skillful and sustained use of propaganda, one can make a people see even heaven as hell or an extremely wretched life as paradise”…. Yet, the Indian politicians indebted to hyper-rich businessmen do not care. And there are so many Goebbelses who pose as themselves intellectuals and act as middlemen for those hyper-rich to poach into and encroach the ESIC properties. They work as a ‘team’ to ‘lease’ or ‘sell’ the ESIC to the rich. They mix up the issue of purging corruption in an organisation with dumping the very organisation itself. Man made failures in the organisation cannot be used to blame the organisation itself. But, these anti-ESIC propagandists pretend otherwise. They do not want to accept the fact that such man-made failures were only because of the unholy nexus between politicians and bureaucrats. They run away from facing facts or answering questions. They want to use any means to achieve their end of selling the organisation to private-sharks. Greed for large amount of money makes such men immune to sense of justice. That there is corruption in the Collector’s office does not lead one to do away with the Collectorate itself. That there is corruption in election does not imply doing away with the system of election itself. ESIC can be run successfully if it is allowed to run corruption-free. The ESIC is the brainchild of great souls. It has been built up from scratches. It became a mighty organisation because of the sustained efforts of so many committed officers, staff in both the general and medical side. So many judgments of Courts uphold this fact. There are so many devoted and dedicated officers and staff members in the ESIC. Numerous success stories are there but the propagandists would not even have a look at it. The murkier side they project became murkier thus mainly because of the political patronage and interference in the System. A lot has been said about them in various Posts in this website. 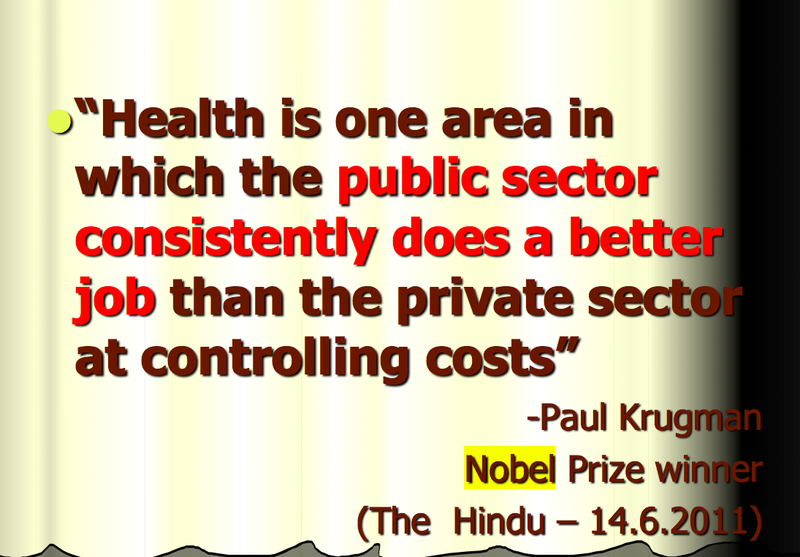 The propaganda of these anti-ESIC groups that privatisation would work wonders is a white lie. Such a stand is not based on empirical facts. On the other hand there is clear proof that the politicians who worked overtime for privatisation and globalisation had, actually, been cheating the public for long. In the year 1993, Mr. Manmohan Singh & Co, had been batting for globalisation. One vividly remembers him and Mr. Chidambaram proclaiming day-in and day-out that globalisation would bring in glorious days for the nation and there would be transfer of technical know-how and what not. Can anyone say what technical know-how has been brought into India by Coca-Cola and Pepsi during the past 22 years? Has any one examined the cost-benefit ratio of having allowed these two units to enter India? How much money is siphoned off by them out of India every year, as profit? In the year 2011 and 2012, the same Mr. Singh, during the Independence Day address said that large section of children in India suffer from malnutrition. He said, on 15.08.2012, “We would achieve independence in the true sense only when we are able to banish poverty, illiteracy, hunger and backwardness from our country…. Malnutrition in children is a big challenge for us..” Dr. Singh was talking of ‘banishing’ poverty, 21 years after injecting his globalisation-liberalisation-privatisation-medicine in the body of the nation. When Germany had been reduced to ashes in 1945, she gathered herself up and became a mighty nation within a period of 20 years. Her DM attained full value in 1971, within 26 years. 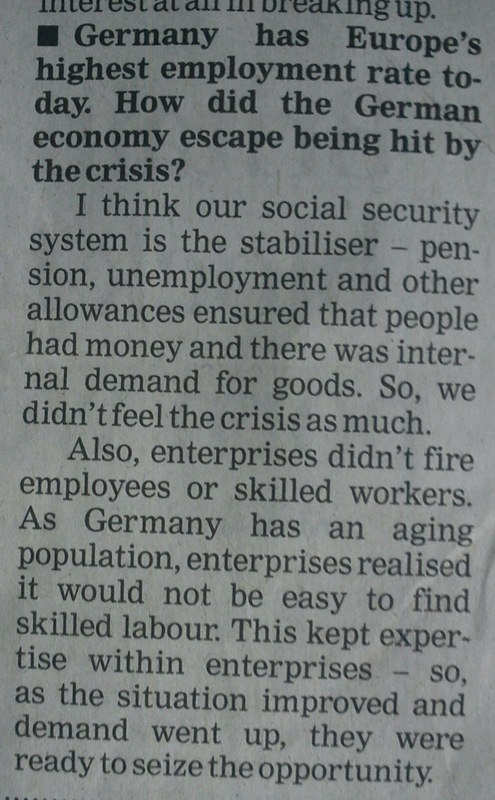 That economic miracle could be achieved by Germans because of the effective social security system of the nation. ￼But, both Mr. Singh and Mr. Modi are afraid of having a look at these historical feats through Social Security run by public sector. Because, their aim is not welfare of the common-man but the welfare of the super-rich. 1. It is now said in Para 6.g. 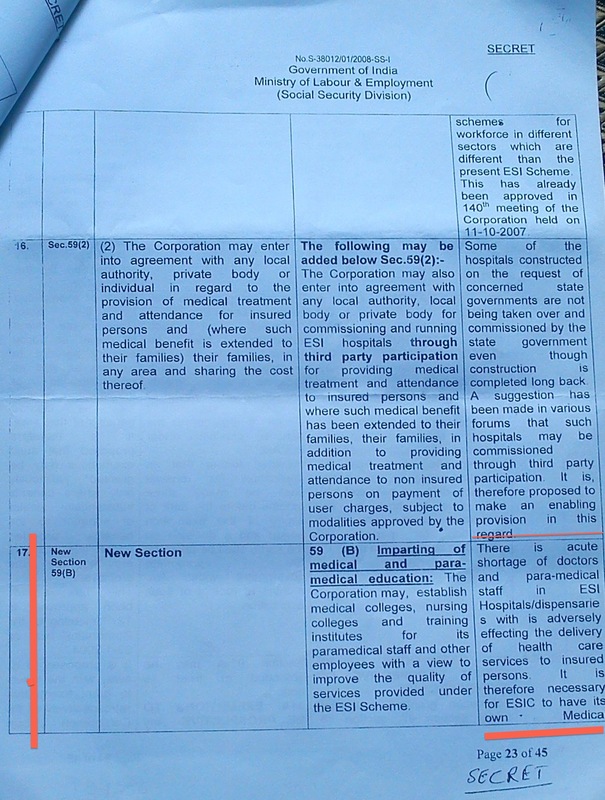 (Page 8) of the Summary Record of the 3rd meeting of the Sub-Committee on Medical Services and Medical Education held on 13.05.2014, that “Setting up and running of Medical Colleges is a cost intensive proposition in r/o capital cost, recurring cost, loss of revenue, etc.,” In Para 6.h (Page 9) of the same report, the Sub-Committee says that “based on current projections, the surplus funds of the corporation are likely to be negative by 2016-17. ◆ How is it then when the Bill 66 of 2009 for amending the ESI Act was introduced in the Lok Sabha, the Financial Memorandum said in Para 3 that “The Bill does not involve any expenditure whether recurring or non-recurring nature”. ◆ How was the Ministry of Law and the Ministry of Finance convinced to certify thus, when the Medical Colleges involve recurring expenditure? ◆ How is it that when the Parliamentary Standing Committee on Labour asked the same question, it was given wrong information as reply? ◆ How did that Parliamentary Standing Committee made to become victim to wrong information and was made to give its approval for setting up medical colleges? 3. It is now said in the Hqrs. Memo. No. L-11/12/3/20-(Corporate Cell) / ME Cell dated 05.01.2015 that the “ESIC should exit the field of medical education entirely as it is not the core function of the ESIC”. 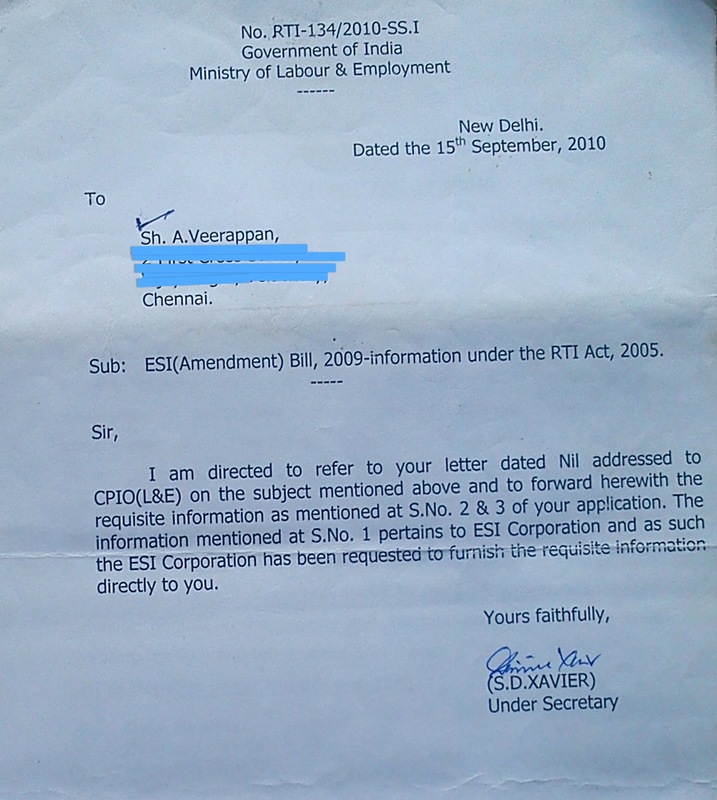 How is it that the Advice Department of the Ministry of Law cleared the draft Bill on 26.06.2009, within a record period of two days, without examining the real issues involved in it which were legally and constitutionally objectionable? (For more details: —). 4. 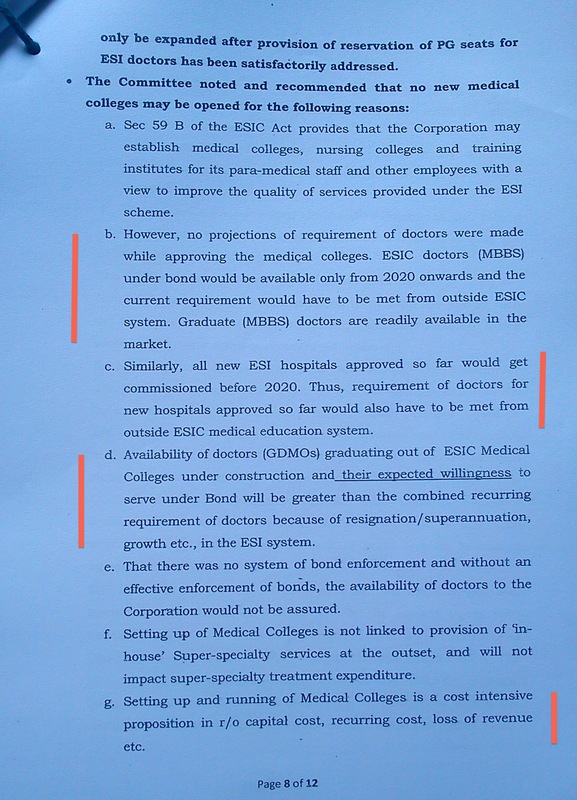 How is it that the ESIC authorities say, in their Memo dated 18.03.2015, that “Admissions to ongoing MBBS/BDS?PG courses at ESIC Medical Education Institutions shall be continued” when they proclaimed on 05.01.2015 that the ESIC was going to exit the medical education itself? 5. 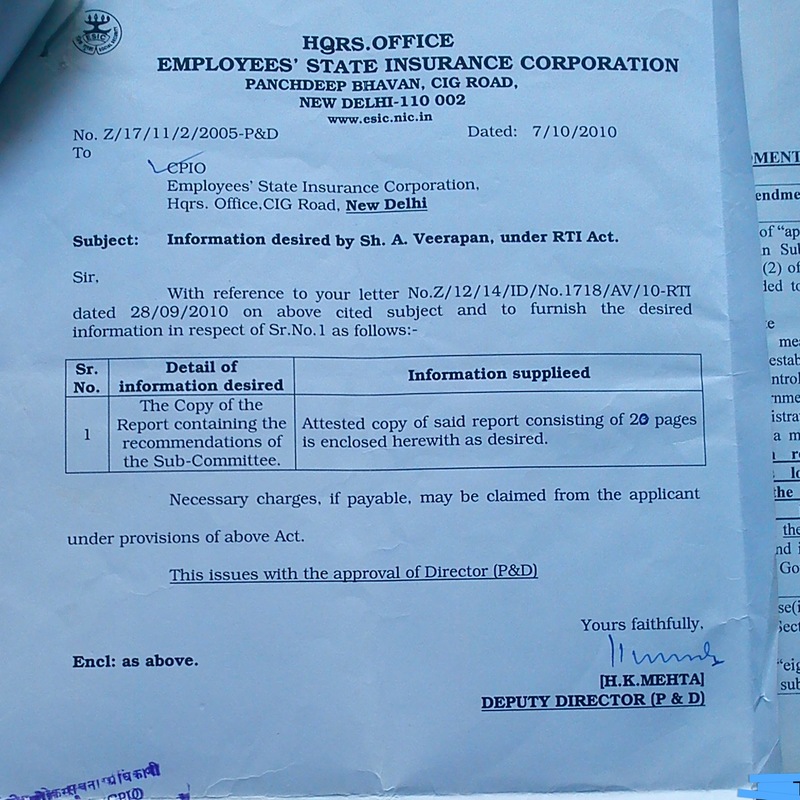 How is it that they invite further problem to the ESIC and create, thereby, problems to the future student community also by admitting one more batch of students, when they had gone on record saying that the ESIC “did not have the core competency to run medical colleges” and that the medical colleges may be handed over to ‘relevant agencies with capability and mandate to run medical colleges’ (Vide Item 6/1 of the Action Taken Report on the Record of Discussions at the Presentation made by the MOLE to the Prime Minister on 05.07.2014). A. Will the authorities assure that the Medical Colleges, Hospitals and the buildings of these institutions at Rajaji Nagar (Bangalore), K.K. Nagar (Chennai), Joka (Kolkata) and Dental College (Rohini) will never be handed over to any private players in future? B. Or, will these four institutions also be handed over to private players, after some time and whether it was only for that purpose admissions are sought to be made for another batch of students ? C. What is the difficulty for the authorities to conduct a comprehensive Consumer Satisfaction Survey to know the opinions of the beneficiaries about the functioning of the ESI Scheme in the public sector? 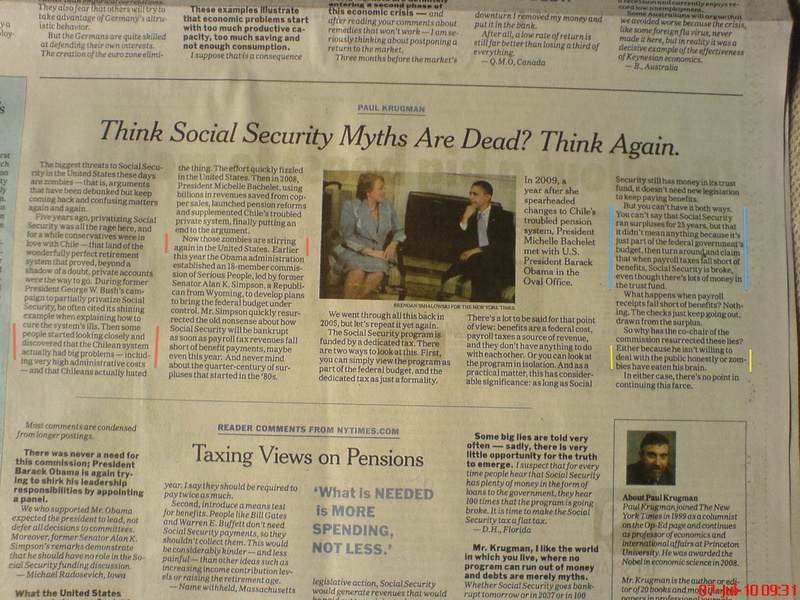 D. What sort of study was made by the authorities to examine the experience of other countries regarding privatisation of social security? E. Was the International Labour Organisation consulted before embarking on such major changes? Because even before introducing the Bill in 1946, Indian Government had invited Mrs. Stack and Mr. R. Rao to study the proposal of Dr. Adharkar and the draft Bill and offer their suggestions. 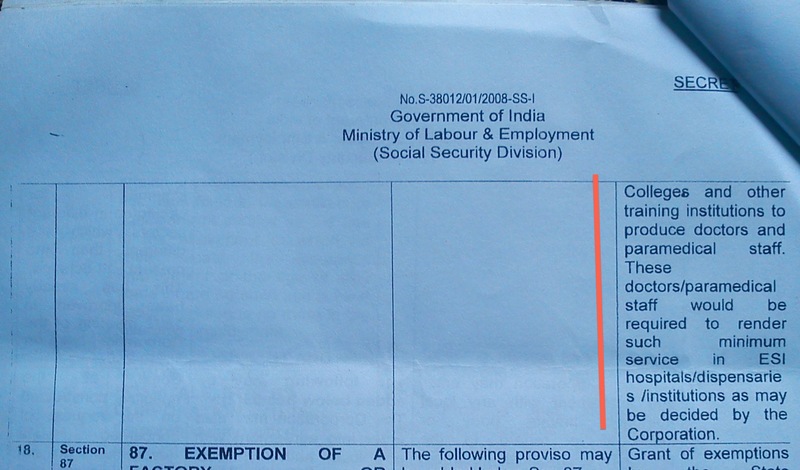 The final Bill that became ESI Act was as per the suggestion of the ILO only. 1. Where is the provision in Sec. 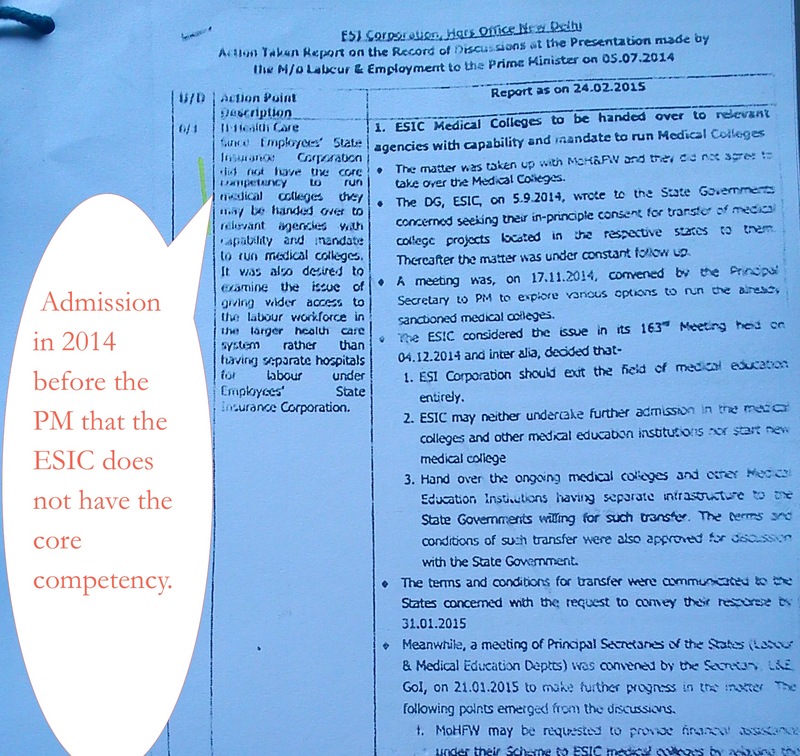 59-B to empower the ESIC to run the “medical colleges” through private players or even through State Governments? Such third party participation is permitted by Sec. 59 (3) only to run the ESI Hospitals and not Medical Colleges. How can the ESIC mix up Sec. 59(3) with Sec. 59 (B)? 2. Besides, the basic issue is, where is the continued need for the ESIC to run medical colleges and also to seek PPP for that purpose, when it has found out that it is not its core activity, at least, now? 3. When the Administration has admitted that the buildings of 8 more medical colleges are only “under construction”, why should it not forget about medical colleges but use the infrastructure created, for some other purposes, in such a manner that it generates permanent rental income to the ESIC to add to the ESI Fund, to offset the money lost during the last six years? 4. Is it obligatory for the ESIC to run those medical colleges through proxies, either through the State Government or through PPP or through other methods (as implied from the world ‘etc’), just because buildings have been constructed or just because the MCI is going to give permission to it? 5. When the Private Players are allowed to run the medical colleges, will they be running it as per their own licence or by using the licence obtained by the ESIC from the Medical Council of India? 6. If the ESIC is using the licence obtained by it for running the medical colleges and allowing that licence to be used by the private players, will it be legal, when the ESIC has gone on record saying repeatedly that running the medical colleges is not its core activity? 7. Would those private players be able to get permission from the Medical Council of India to run medical colleges on their own? Are these private players permitted to be the beneficiaries of the misadventure and discomfiture of the ESIC in having illegally started construction of buildings spending thousands of crores of rupees from the year 2008? 8. How is it that some private players like Reliance, SRM and others are reported to have already entered the premises of various (proposed) medical colleges at Coimbatore, Joka and other places, officially and inspected the infrastructure under construction? 9. Is it true that those private players would admit students under Management Quota to make money, using the licence granted to the ESIC for starting medical colleges? 10. What is the significance of giving only 15 days’ time to the State Governments to accept the Terms and Conditions framed by the ESIC before and for inviting the private players to have a role in running the medical colleges on behalf of the ESI Corporation? We request the Members of the ESIC not to fall prey to the one-sided propaganda of the ‘team’ of pseudo-intellectuals who make their living by brokering for the rich and crushing the poor. They can make easy living that way; can have direct links with power-centres; can enjoy the glory of getting articles published in news papers. But, that is not in the interest of the working population. The members of the ESIC have a vital role to play on 07.04.2015 to save the nation from chaos and for that purpose they should not fall prey to the propaganda of various kinds against the ESIC without hearing the other side. “The receptivity of the masses is very limited, their intelligence is small, but their power of forgetting is enormous. In consequence of these facts, all effective propaganda must be limited to a very few points and must harp on these in slogans until the last member of the public understands what you want him to understand by your slogan”. We thank the Members in advance for asking these questions! ESIC Sub-Committee wants to establish medical colleges and prepares ground for amendment that came in later in 2010. ESIC Sub Committee of 2014 says the decision to open medical colleges was wrong. The link to this Post has been sent to many Members of the ESIC through email, as available in the website of the ESI Corporation. A few documents have been scanned and uploaded today in the above post as Appendices. ESi corporation beside all the benefits has a unique advantage. It is easily manoeuvrable thanks to political pressure and corrupt ground level officials.there can be no competition with ESIC.howsoever hard may anyone try.